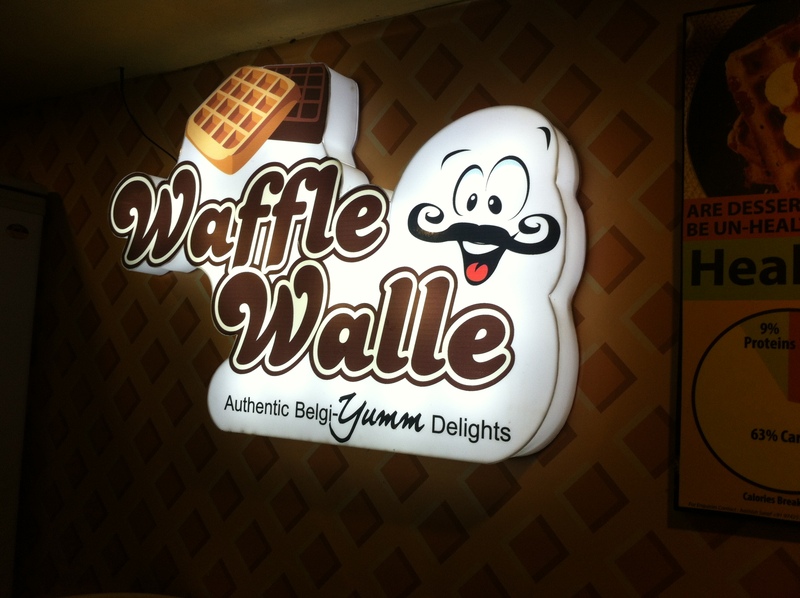 Waffle Wale is the newly opened kiosk in Meenakshi Mall which is located on Bannerghatta Road. I got a chance to visit here along with my wife. Honestly I never heard about waffles and don’t even know what exactly is that. But trust me the experience along with the taste was impressive. I am basically not a chocolate or sweet lover but now I started falling in love with waffles after having here for the first time in my life. 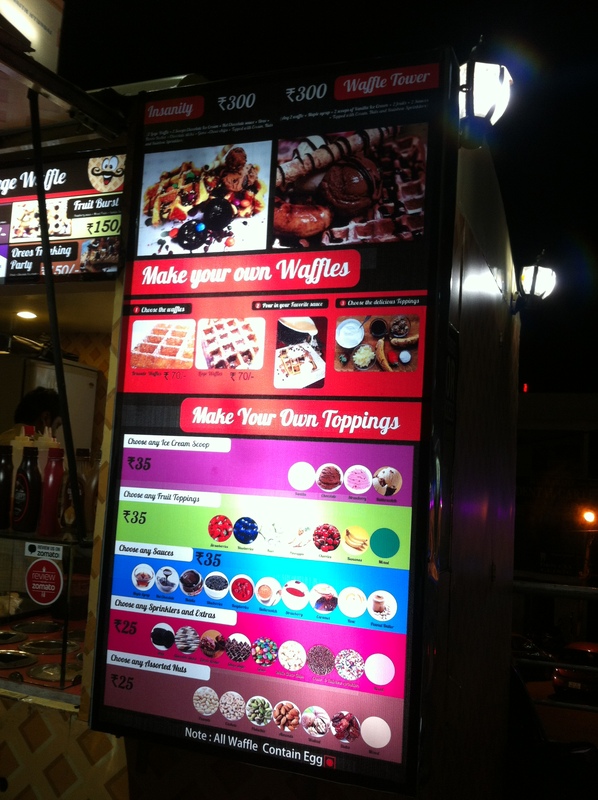 I asked the person who owns this kiosk about the waffles and their origin. He explained everything about it and impressed too (Being a foodie, I should know all these stuff). Now it’s time to talk about the Waffles which we had, they basically offer 2 types and tried both with so many toppings and syrups. We requested them to provide in smaller portions as I felt it was huge and I might not get chance to taste maximum waffles. 1. Liege Waffle – Waffle itself was very crispy and brilliant with the syrups and topping. Pearl sugar added in it caramalizes the waffle indeed making it great. 2. Brussels Waffle – It looks like an Ice Tray and tastes great. Hmmm, I got a chance to try smaller portions of both liege and Brussels waffles. I liked Brussels waffle more than liege waffles. 1. Brussels Waffle with Vanilla Ice-cream and strawberries – Trust me this is heaven and became a fan of waffles. 2. Brussels waffle with Maple Syrup – Mouth just waters if I think about this waffle, tastes awesome in one single word. 3. Liege Waffle with Nutella jam – I just tried and felt ok, as I said I am not a chocolate lover but my wife was impressed with it. 5. Brussels waffle with rose blended syrup – One among my best, must try – Tastes really great and no words to explain. 6. Brussels waffle with Kiwi fruit and some syrup – I did not like it completely but it might be good for others. 7. Liege waffle with fresh blueberries – This is one of my favorites and I definitely recommend this for non-chocolate lovers like me. 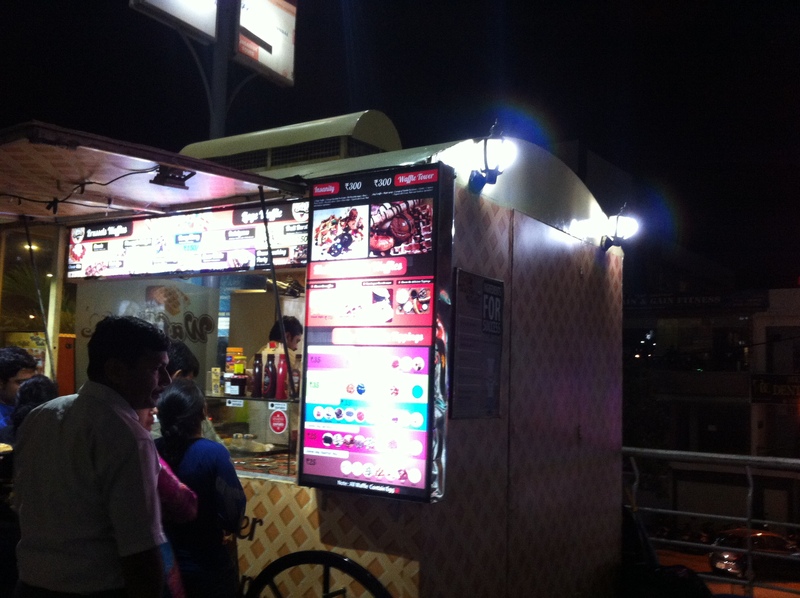 Especially I would like to thank Mr. Chetan (Who owns this Kiosk) for his hospitality and recommendations in choosing best waffles. I feel everything is good here with those beautiful mouthwatering syrups and toppings. This is one of the best place and only place to get a quick and best service from a kiosk staff. Everyone are so attentive and customer friendly. Overall it was a great experience and everyone should visit this waffle shop!! Next Post "Elegance Redefined" – 24@43 in Crown Plaza, Electronics City, Bengaluru.